This wine comes in a very dubious looking tetra-pack. There are farmers picking grapes on the label. There is a wine bottle – a wine glass. And yet – when I first saw this package, and even now, I think that this is a chicken broth package. But it is not chicken broth and remarkably the wine is not bad. It is quite passable – light, fruity and slightly acidic. This is not really a table wine. It is not just the tetra-pack or the image on the front. The wine is fine – as I mentioned. The wine is quite uninteresting. The fruitiness is unremarkable and rather generic. It will make a fine wine for a picnic. Or camping. Or the beach. Or even just chilling on the deck. This is the first passable cheap Quebec wine that I found. I had such high hopes for this wine. Wow was the first sip sour. Not too good. The second sip was not much better. This wine is very acidic – to the point that I can’t really taste the wine. It has a pink flavour I guess – kind of like kids drinks that the flavour is stated by the colour. Purple flavour, orange flavour, red flavour, green flavour. This one is pink but it is not as sweet as the kid’s drinks – it is fairly dry and that just seems to exsacerbate the acidity and the sourness. This label is fine looking. Quite classy – one could mistake it for a nice French wine. The label in the back claims that it is well balanced and well rounded. Frankly it tastes like someone poured a bunch of leftover wine after a party into a vat and topped it off with some tap water to get the volume just right. In fact, this wine is a blend of various wines – none of them particularly good I suspect. The bland flat flavour is punctuated, however, by a bizarre sourness that gets progressively more pronounced as one goes along drinking the wine. I’m just getting down to the end of my first glass and am already thinking that my head will hurt me in the morning if I have another glass. Heck, it might hurt my while I drink the second glass. Do I need to conclude the review by stating you should avoid this mixture? I have to stop drinking these blended wines. I have to stop buying these blended wines. It is hard to do because they are cheap. Some are drinkable. Some are not. Welcome to the latter category. This sour swill gives me no pleasure. The flavour is thin and week and masked by the sourness and acidity. 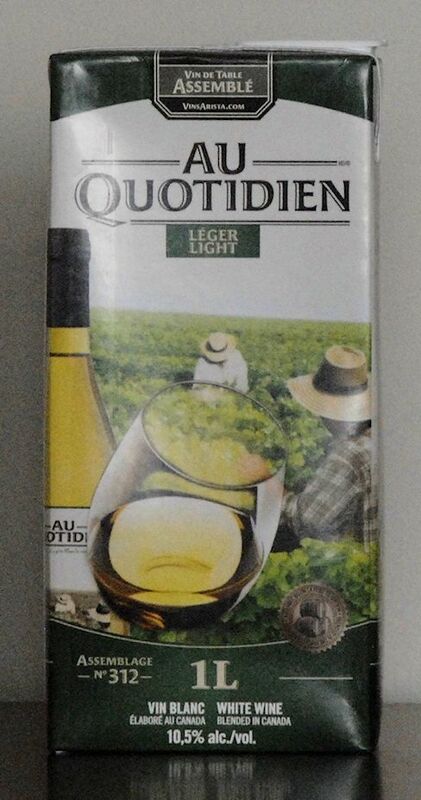 The label states that it is a blend of Pinot Grigio, Muscat and Chardonnay wines – imported and domestic. It calls itself a “Winemaker’s White.” This might be a clue as it can be a blend of international wines that were made a “Make Your Own Wine” shop. It is a shame as I really like the label. It is a shame that there is a bottle of red Twist of Fate that is staring me down – daring me to drink it. It is a shame principally because there is much better wine that is cheaper than this. I approach this wine with great trepidation. I had the white wine a while back and it was quite miserable. So the bar is quite low on this one – if I don’t retch I might consider it passable. Well the wine is OK – again, the bar is not that high. It is not as sour as the white one and there is a bit of flavour that pokes through – some sort of berries I get. It is also a bit spicy that gives it a bit of zing up front. The zing fads fast and it becomes a bit flat and uninteresting at the end. After a few more swigs the zing wears off and it becomes a very pedestrian wine. The bar was set low and it made it just above the bar, but this does not make this a good wine. There are better wines, much better wines, at less than the price of this. There are even Canadian wines, real Canadian wines – with all the grapes grown in Canada, at this price point which are better than this. Occasionally displays of patriotism don’t really work. 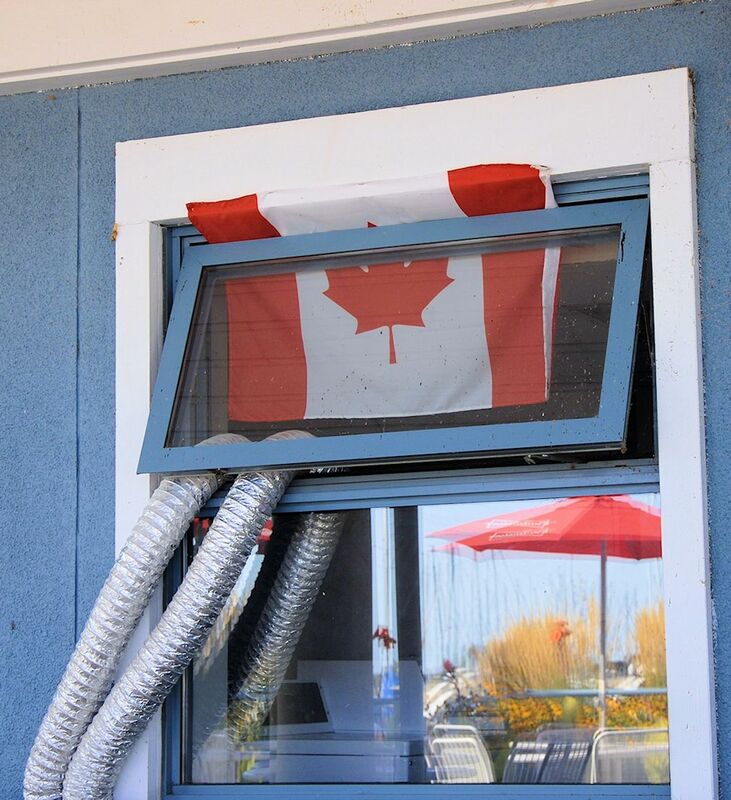 This restaurant’s flag in the window display is rather ackward.